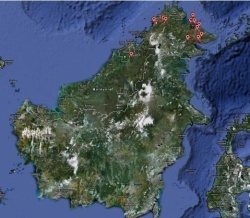 In September 2011 I visited the Malaysian part of Borneo. The Malaysian part of Borneo consists of two states, Sabah and Sarawak. Most of my time was spent in Sabah, only Mulu was located in Sarawak. 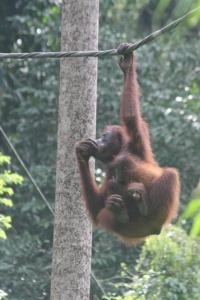 The main draw to Borneo were of course Orangutans, but I also wanted to see other endemic animals and plants. I did get to see a lot of that, but not everything. I had arranged for a private tour through Asia Transpacific Journeys (see itinerary). The local guides were from various local travel agencies. As described below, the organization of the whole trip was perfect, I was very satisfied with Asia Transpacific Journeys, as well as the local travel agencies. After a long flight from Boston through Chicago, and Seoul, South Korea, I arrived in Kota Kinabalu (often just called KK), Sabah, Malaysia late at night. As usual, the first indication of the success or failure of a trip is whether the representative from the travel agency is waiting for me. He was right there when I arrived with a minibus and driver. He was a representative of Borneo Adventure. Like all travel agencies during my trip they were very efficient, punctual and knowledgeable. The first couple of nights I stayed at the Novotel in KK. It was a luxurious hotel with a large suite with separate air conditioning in the two rooms. It is located in a new shopping mall. I had dinner in a restaurant in that mall. It was very expensive, a glass of beer was US$7.00. On the first day in KK I did a city tour with my local guide. KK is a fairly modern city with quite a few very modern shopping malls. It has about 600,000 inhabitants. The airport in KK is very new and modern. The next day we drove to Kinabalu National Park located around Mount Kinabalu, the highest mountain on Borneo. Kinabalu National Park is a UNESCO World Heritage Site. The drive took about two hours. After arriving at the park, I walked around the park for a couple of hours before checking into the Mt. Kinabalu Heritage Resort & Spa. I stayed two nights in that resort. It was the simplest of the hotels/resorts that I stayed in during my visit, but still very nice. The rooms were on the small side, and did not have air conditioning. The next day was spent with excursions in and around the park. In the morning we drove to the Mesilau Nature Reserve for a walk in the forest. We saw some of the huge insect-digesting Pitcher Plants (Nepenthes sp., german: Kannenpflanzen). After a lunch stop in a local roadside restaurant in Ranau, we went to Poring Hot Springs for a Canopy Walk. The Canopy Walk is on a very narrow, swinging suspension bridge, which was very difficult for me to negotiate, since I am seriously afraid of heights. But I made over the whole walk. At its highest it is about 40 m (130 ft) above the forest floor. Just outside of Poring was a place where I could see a blooming Rafflesia. The owner of that plot of land that has Rafflesias makes quite a living of that, he charges 30 Ringgit (US$ 10) for each visiting party. After the second night in the resort, we drove back to KK to catch a flight to Mulu in the province of Sarawak (all the other places were in the province of Sabah). They are kind of weird with immigrations. They do a full immigration check for all flights between provinces within Malaysia. So I had to go through immigration during the intermediate stop in Miri, both going to Mulu and on the way back. There is no road to Mulu; you get there either by plane (a 45 minute flight from Miri, 4 times per day) or by boat (which takes about two days). In Mulu, I was picked up by my local guide for the 5 minute trip to the Royal Mulu Resort next to the Gulung Mulu National Park. I stayed at that resort for two nights. This resort was the most expensive during the trip. A small glass of beer cost almost US$ 7.00. The accommodations were quite nice, the rooms were very large with air conditioning. You have to remember to turn on the hot water hear for 15 minutes before you can take a shower. On the other hand, the water stayed hot for a while, which was nice during a power failure for a couple of hours. The food was very pretty good; buffet style like everywhere. In the evenings they had a dance show with dances from local villages. In the afternoon I went on a long boat excursion to a local village. The long boats are about 10 m (30 ft) long and wide enough for one person, but not quite enough for two. The formerly nomadic jungle tribes are by now all settled in villages. They have generators for electricity, the water is from the river. Most of the staff at the resort are from local villages. On the next day I got up real early and rented a canoe for a couple of hours to paddle up and down the local river. It was a very relaxing excursion. In the afternoon I had a guided tour through some of the caves, including the deer cave, which houses some three million bats. The bats fly out of the cave somewhere around sunset to go foraging for insects. It is a spectacular sight when they leave the cave in swarms of several thousands at a time. The next morning I had another guided tour through two more caves with interesting indigenous plants, so-called one-leaf plants. In the early afternoon I took the flight back to KK via Miri. From KK I got another flight, arriving late in the evening in Sandakan. There a representative from S.I. Tours was waiting for me for the transfer to the Sepilok Nature Resort, where I stayed for two days. This guide stayed with me till I arrived in Lahad Datu and transferred to the Borneo Forest Lodge in Danum Valley. In Sandakan I visited the Sepilok Orangutan Rehabilitation Center to see my first Bornean Orangutan (Pongo pygmaeus, german: Borneo-Orang-Utan, french: Orang-outan de Bornéo), the second largest of the Great Apes. In the afternoon I went on a canopy walk. In this case it is a solid bridge, not a swinging suspension bridge, which was much more comfortable for me. In the evening I went on a guided night walk. I saw a couple of poisonous snakes and some birds. But the highlight were the flying squirrels. Seeing these squirrels glide through the air is fascinating. The next morning we drove to Sim Sim, a water village, built on stilts above the water. This is where the boat leaves that ferries people to one of the islands in the Turtle Islands Marine Park, Pulau Selingaan. I stayed on Pulau Selingaan for just one night. After arriving on Pulau Selingaan I walked around the island for a while. Already during the walk from the jetty to the bungalow I saw a huge water monitor lizard. It was at least 2 m (7 ft) from nose to tail end. The island is small, so it takes only an hour or so to walk around the island. In the afternoon I rented snorkel gear and went snorkeling for a couple of hours. It was really great what you could see just along the beach. There were a lot of different fish species. The most interesting were a couple of clown fish living in a sea anemone and a small moray eel. Very colorful were the many different tube worms with their Christmas-tree like feeders in all kinds of colors; and the large clams with their mantles in various shades of blue, green, and purple. In the evening it was turtle watching time. We first watched a Green Sea Turtle lay her eggs (there were 97 of them). After the egg laying, you go to the hatchery, where the eggs are deposited in a hole in the sand. The ranger deposits the eggs and puts a wire fence around it. This fence keeps predators out, and keeps the baby turtles confined till they can be collected and released. Every night, some of the clutches hatch. All turtles in one clutch hatch together. They are confined by the wire fence around their incubation nest. When they are all hatched, the rangers collect them in a bucket and release them on the beach. We watched the release of one of those clutches of baby turtles. The rangers make sure that all the baby turtles reach the water, but from then on they are on their own. Usually not even one out of a clutch makes it back as an adult. The next morning we took the speed boat back to Sim Sim. From there I had a tour of Sandakan. There is not really much to see in Sandakan,you can skip that excursion if you have something better to do. In the early afternoon the trip continued by speed boat along the ocean shore towards the east for a while and up the Kinabatangan River for about 50 km (31 miles) to Abai. The speed boat is really speedy, I clocked it at 50 km/h (31 mph) with my GPS. I stayed at the Abai Jungle Lodge for one night. The lodge was very comfortable, the food pretty good. There are raised walkways through the jungle around the lodge. You can see birds and some insects from these walkways. At this lodge I had four excursions, one in the afternoon after arrival, and one at night. The next morning I had an early morning excursion and a mid-morning one. All excursions were by boat. I saw lots of birds along the river, including egrets, herons, and kingfishers. Spectacular were the monkeys, especially the Proboscis Monkeys (Nasalis larvatus, german: Nasenaffe, french: Long-nez), a species endemic to Borneo. Around the lodge I saw my first Bornean Orangutan in the wild. It is a 6-7 year old female that hangs around the lodge a lot. In the afternoon, I continued by speed boat to the Kinabatangan Lodge in Sukau, another 50 km (31 miles) up river, to stay for one night. The lodge was similar to Abai, very nice accommodations and good food. In the afternoon after arrival I went on another boat excursion to watch various species of monkeys, including proboscis monkeys. From Sukau we drove to Lahad Datu. This drive is through miles and miles of oil palm plantations. It takes about two hours to get to Lahad Datu. Both the Borneo Forest Lodge in Danum Valley and the Tabin Wildlife Resort have offices in the airport building where they pick up new guests. I was picked up by a driver in a 4-WD Toyota. The drive to the Borneo Forest Lodge takes about 2 ½ hours, ½ hour on paved roads, the rest on unpaved, but fairly good roads. Most of the area is secondary forest that had been logged and is being re-forested. The Borneo Forest Lodge itself is in untouched primary rainforest. The drive to and from the lodge is the main opportunity to see Borneo Pygmy Elephants (Elephas maximus borneensis, german: Borneo-Zwergelefant, french: Éléphant de Bornéo). They prefer the secondary forest which provides more food. I saw a lot of elephant droppings, and on the return trip saw a lot of area where the elephants had crushed the undergrowth while foraging, but I didn't see elephants. I stayed at the Borneo Forest Lodge for two nights. Again, the accommodations were very nice, and the food excellent. My private guide there was the best on this trip. He was very professional and knowledgeable, and knew where to go to find animals. The whole organization at this lodge is first class. All the rangers and guides have walkie-talkies. Whenever a ranger or guide spots an interesting animal, he informs the other guides and rangers, so they can bring the guests to the right places. This worked very well. For instance, during the second night excursion a ranger spotted a Western Tarsier (Cephalopachus bancanus, german: Sunda-Koboldmaki). My guide heard about it right away and could bring me there immediately. At the Borneo Forest Lodge I had four excursions per day, early morning,mid-morning, afternoon, and night. I saw a lot of animals during these excursions. After two days at the lodge it was time for the next location, the Tabin Wildlife Lodge. After the 2 ½ hour return trip to Lahad Datu, the bus from Tabin picked me up at the airport office in Lahad Datu. The drive to the Tabin Lodge is about 2 hours, again about ½ hour on paved roads, the rest on unpaved but good roads. The Tabin Wildlife Reserve is mostly secondary rainforest that had been logged but has been regrowing for about 20 years. There is a small area of primary rainforest in the center of the reserve. I stayed in the Tabin Lodge for four days. I had three excursions per day, early morning, late afternoon/evening, and night. The early morning excursion usually lasted from about 6:30 to 10:00, longer than other excursions. The night excursions were the best of the trip, I saw a lot of different animals. On the third day during the afternoon/evening excursion I finally saw the Pygmy Elephants. Unfortunately, it was already too dark for pictures without flash, and the elephants were too far away for the flash to reach, so I didn't get a good picture of them. After four days at Tabin, I was driven back to Lahad Datu (after another morning excursion). I had a late afternoon flight to KK to start the long trip back home. I was up and going for about 50 hours before I got home. Traffic was pretty disciplined everywhere I went. Mostly there was not much traffic. Only KK, Sandakan and Lahad Datu had significant traffic. I liked the food everywhere. It was almost exclusively buffet style food. It usually consisted of various chicken, beef, and fish dishes, always with rice, but also noodles and/or potatoes. There was always soup, sometimes salad, and always fruit for dessert. It was always tasty, but not spicy. Beer was generally quite expensive, from US$3.00 to US$7.00 per glass or bottle. It was available everywhere, there are no religious restrictions that I was aware of. It is the usual German style lager beer, which is just what I like. The main industries in the Malaysian part of Borneo are palm oil and natural rubber. Agriculture is mostly for local use. Unfortunately, there is still a lot of slash-and-burn clearing of rain forest going on. Vast areas of the Malaysian part of Borneo that I saw were palm oil plantations. I was told that the government is not cutting rainforest anymore, but I am not so sure that this is true, I saw quite a few fires burning during the local flights. On the way from KK to Mt. Kinabalu, I saw for the first time a rubber tree plantation. Natural rubber is actually making a comeback because of rising oil prices, since the competition for natural rubber is all based on oil products. Malaysia seems to have a stable government. It is a federal constitutional elective monarchy, similar to the government in England. There are 13 states in Malaysia, nine of which have hereditary kings. Every five years, they elect one of themselves as the king of Malaysia. The federal government consists of a lower house and an upper house, each state has a state government. 50% of the people are Muslim Malay. Overall, about 11% of the population in Malaysia are indigenous peoples. In Sarawak, half the population is indigenous, in Sabah it is 2/3. Among the rest of the population are about 27% Chinese and 7% of Indian descent. There seem to be no major frictions between the different ethnic and religious groups at this point. Altogether, it was a great trip. The whole environment of the trip was not quite what I expected, but that was my fault. I somehow thought "Borneo, that sounds primitive". I didn't think about it enough. I was visiting Malaysia, which is a very well developed country. There was nothing primitive or simple during this trip. Everything was actually quite luxurious in the various lodges, everything was very well organized, the guides were very knowledgeable and fluent in English. I did see most of the animals that I wanted to see, all of them actually that I could reasonably expect to see. The ones that I didn't see (Pygmy Rhinoceros, Clouded Leopard, and Banteng) are so rare that you have basically no chance of seeing them on such a trip. I have gathered the probabilities to see certain animals during a visit to the various places that I went to.